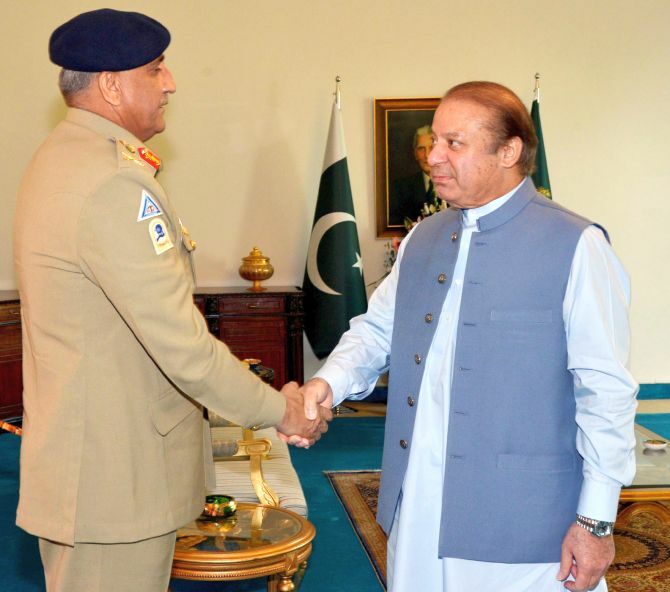 IMAGE: Pakistan army chief General Qamar Javed Bajwa with then prime minister Nawaz Sharif, right. The Pakistan army is said to despise Nawaz Sharif and wanted him out of office. Hasnain Malik has had a long career in institutional investing and read philosophy, politics and economics at Oxford University. He explains political and economic issues in Pakistan against the backdrop of general elections in July in an interview with Aditi Phadnis. Just a few months ahead of elections, Pakistan's current account deficit has increased 50 per cent in the past year. Both the International Monetary Fund and the World Bank have warned that the current account deficit could hinder Pakistan's economic growth. What are the main reasons for CAD? It is probably more meaningful to express the CAD widening as a percentage of GDP; in the 10 months of fiscal 2018, so far, there has been about a 1.6 percentage point increase. The reasons for expansion of the current account deficit are excessive consumption of imported products at an over-valued exchange rate, machinery imports related to China–Pakistan Economic Corridor-driven infrastructure upgrade and sluggish performance of exports. The damage caused by this has partly been reflected in the aggregate 10 per cent devaluation since the end of 2017 but the very low level of foreign exchange reserves, close to 2.5 months of import cover, suggests there is more currency weakness to come. The US has cut military aid to Pakistan. Development spending was cut by 20 per cent to Rs 800 billion ($6.92 billion) in the budget presented a few weeks ago. The government has scaled back on infrastructure spending to meet tight fiscal targets. Engagement with the IMF would be driven by the need for assistance to manage vulnerability of the external account, in other words finance for the CAD, not in order to prop up growth. It will likely take time for exports to pick up on the back of the infrastructure upgrade and the more competitive exchange rate. Until then there will be a tightrope to walk in terms of balancing growth with currency stability. And that tightrope becomes frayed in a higher oil price environment. Given the oil price increase this year, continuing high growth, the implementation of the tax amnesty so close to the end of the outgoing parliamentary government, there is a need for external financing. The Chinese have already provided some of this in the form of bilateral loans. Other frontier economies are still issuing Eurobonds at reasonable rates but, clearly, the cost of all this external finance would be lower if there was an IMF loan. This is not because of the quantum of any potential IMF loan but rather because of the credibility that IMF loan conditions would impart to economic policy. The Pakistan Muslim League (PML-N) and Pakistan Tehreek-i-Insaf (PTI) seem to be the most important political players on the political scene at the moment. The Pakistan Peoples Party (PPP) appears to have joined hands tactically with the PTI. Given their track record, what sort of economic manifesto should we expect from PML-N and PTI-PPP? Your question assumes that each party actually publishes a manifesto. The PTI alone have paid sufficient respect to the electorate to do this. But there is also a political motive: To persuade the electorate and the army that they are about more than simply the issue of anti-corruption. Nevertheless, all parties are broadly in favour of technocratic, orthodox macroeconomic policy in terms of monetary policy to deal with inflation, fiscal policy to prevent deficits spiralling out of control and exchange rate policy to prioritise stability but not to a fault. Also, all parties are in favour of continuing engagement with the Chinese and the implementation of the CPEC. But there are clear differences on the issue of structural reform. The PML-N is all about the status quo: Mega projects, high external borrowing and sluggish pace in structural reform. The PPP no longer appears to be a credible federal electoral challenger but, rather, a potential coalition partner. As such, they likely do not have a serious input into economic policy. Their track record suggests they have a similar hands-off approach to structural reform and undocumented vested interests as the PML-N, but they lean slightly more towards rural agricultural interests compared to the PML-N's slight bias to industrial interests. The PTI's approach is to focus squarely on structural reform, directly addressing the achilles heels of Pakistan's development story: Non-payment of tax and utility bills, loss making State-owned enterprises and under-performing indigenous sectors such as agriculture. The tacit difference here is that the outlook for the undocumented, black economy interest groups is very different. Imran Khan has made corruption of the PML-N his main campaign plank. But he appears to overlook or ignore the corruption of the Pakistan army. This suggests he will be a willing and pliant toy in the hands of the army. Whether the army is guilty of corruption is your assumption, not mine. However, clearly, the army remains the dominant political and economic institution in Pakistan. A little like the US military-industrial complex of the Eisenhower era of the US in the 1950s and 1960s; a complex which has survived the exponential growth of lobbyists and private sector corporations, the likes of which we have not yet seen in Pakistan. Therefore, no civilian party can rule without co-habiting with the military. That is not a democratic ideal obviously, but it is a practical reality. It is a consistent feature of politicians in Pakistan that their rhetoric on the army softens the closer they get to the seat of power. You can label that as hypocritical inconsistency or political pragmatism. Your question is ironic that for many years Imran was painted by his critics as a naïve, impractical ideologue. Now that he is demonstrating flexibility and tactical awareness, his critics highlight his selective flying of the anti-corruption banner. Isn't that politics though? Achieving the most for your constituency within the practical limits of the system. Ultimately, for anyone with an interest in Pakistan, whether citizens, foreign allies, investors or, indeed, neighbours, the country is likely more secure and reliable with a cleaner civilian political and bureaucratic class, which enables the economy to function in a more sustainable fashion. A lot has been made of the Islamic parties and their electoral success in the last few months. Do you think they can replicate this in the July election? The recent elections you point to amount to increasing their share of vote, but still losing, in specific by-elections, not national elections. The use, and in some cases misuse, of Islam as a way of appealing to large elements of the electorate is a long-running feature of politics in Pakistan. In some ways, this is not very different from the appeal to and use of religion by politicians in the US or India, let alone many other democratic and non-democratic countries. In Pakistan, the Islamic parties are neither homogenous nor unified. They do not represent a distinct, single, nationally organised bloc in politics akin to, for example, the now defunct Muslim Brotherhood or Salafist parties in Egypt. They are, however, in some respects, fringe or radical extensions of sentiments expressed or tolerated in all of the mainstream parties. Their agenda cannot be ignored but they do not represent a federally credible electoral threat; at best, a small ingredient in a future coalition. These explicitly religious elements are more important for their disruptive potential outside the electoral and parliamentary process. What if Hafiz Saeed is part of Pakistan's next govt?